For other uses, see Great Rift Valley (disambiguation). The Great Rift Valley is a series of contiguous geographic trenches, approximately 6,000 kilometres (3,700 mi) in total length, that runs from the Beqaa Valley in Lebanon in Asia to Mozambique in southeastern Africa. While the name continues in some usages, it is rarely used in Geology nowadays as it is considered an imprecise merging of separate though related rift and fault systems. 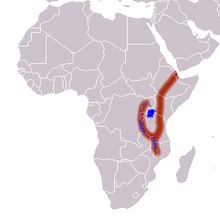 Today these rifts and faults are seen as distinct, although connected, but originally, the Great Rift Valley was thought to be a single feature that extended from Lebanon in the north to Mozambique in the south, where it constitutes one of two distinct physiographic provinces of the East African mountains. It included what today is called the Lebanese section of the Dead Sea Transform, the Jordan Rift Valley, Red Sea Rift and the East African Rift. These rifts and faults were formed 35 million years ago. 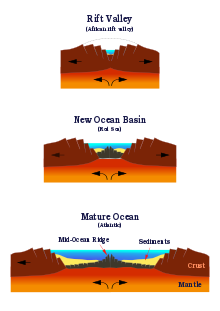 The northernmost part of the Rift corresponds to the central section of what is called today the Dead Sea Transform (DST) or Rift. This midsection of the DST forms the Beqaa Valley in Lebanon, separating the Lebanon from the Anti-Lebanon Mountains. Further south it is known as the Hula Valley separating the Galilee mountains and the Golan Heights. The Jordan River begins here and flows southward through Lake Hula into the Sea of Galilee in Israel. The Rift then continues south through the Jordan Rift Valley into the Dead Sea on the Israeli-Jordanian border. From the Dead Sea southwards, the Rift is occupied by the Wadi Arabah, then the Gulf of Aqaba, and then the Red Sea. Off the southern tip of Sinai in the Red Sea, the Dead Sea Transform meets the Red Sea Rift which runs the length of the Red Sea. The Red Sea Rift comes ashore to meet the East African Rift and the Aden Ridge in the Afar Depression of East Africa. The junction of these three rifts is called the Afar Triple Junction. East Africa with active volcanoes (red triangles) and the Afar Triangle (shaded, center)—a triple junction where three plates are pulling away from one another. 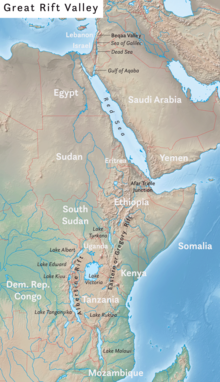 The East African rift has two branches, the Western Rift Valley and the Eastern Rift Valley. The Western Rift, also called the Albertine Rift, is bordered by some of the highest mountains in Africa, including the Virunga Mountains, Mitumba Mountains, and Ruwenzori Range. It contains the Rift Valley lakes, which include some of the deepest lakes in the world (up to 1,470 metres (4,820 ft) deep at Lake Tanganyika). Much of this area lies within the boundaries of national parks such as Virunga National Park in the Democratic Republic of Congo, Rwenzori National Park and Queen Elizabeth National Park in Uganda, and Volcanoes National Park in Rwanda. Lake Victoria is considered to be part of the rift valley system although it actually lies between the two branches. All of the African Great Lakes were formed as the result of the rift, and most lie within its rift valley. In Kenya, the valley is deepest to the north of Nairobi. As the lakes in the Eastern Rift have no outlet to the sea and tend to be shallow, they have a high mineral content as the evaporation of water leaves the salts behind. For example, Lake Magadi has high concentrations of soda (sodium carbonate) and Lake Elmenteita, Lake Bogoria, and Lake Nakuru are all strongly alkaline, while the freshwater springs supplying Lake Naivasha are essential to support its current biological variety. The southern section of the Rift Valley includes Lake Malawi, the third-deepest freshwater body in the world, reaching 706 metres (2,316 ft) in depth and separating the Nyassa plateau of Northern Mozambique from Malawi; it ends in the Zambezi valley. ^ Merriam-Webster, Inc 편집부 (1997). MERRIAM WEBSTER'S GEOGRAPHICAL DICTIONARY 3/E(H). Merriam-Webster. p. 444. ISBN 978-0-87779-546-9. Retrieved 22 November 2012. ^ Philip Briggs; Brian Blatt (15 July 2009). Ethiopia: the Bradt travel guide. Bradt Travel Guides. p. 450. ISBN 978-1-84162-284-2. Retrieved 22 November 2012. ^ a b c G. Yirgu; C. J. (Cindy J.) Ebinger; P. K. H. Maguire (2006). The Afar Volcanic Province Within the East African Rift System: Special Publication No 259. Geological Society. pp. 306–307. ISBN 978-1-86239-196-3. Retrieved 22 November 2012. Wikimedia Commons has media related to Great Rift Valley. "Great Rift Valley" . New International Encyclopedia. 1905. This page was last edited on 26 March 2019, at 14:27 (UTC).